Mid April in Central Ohio means spring flowers are blooming. Most of the photos are of Tulips and Hyacinths. Recently we stopped by Franklin Park and were surprised to see a large area fenced in near the Conservatory that had always been part of the overall park. With our return visit, we found that over the last year they had added the ‘Grand Mallway’, a nicely landscaped area. As part of the Conservatory’s Topiary display, there were a number of flamingos displayed here. They were an interesting mix of floral and painted moss. With our mid September visit, much was still in full bloom. The flamingos and sculptures backed by the glass Palm House. The Mallway is a great addition – adding much needed outdoor space to the complex. Ringing the outside of the area is this covered walkway. It also provides interesting views of the Palm House. The entrance to the Childrens Garden featured more topiary art. Including a butterfly. The Conservatory has a great butterfly display (featured on another blog posting today). Personally I like the permanent Topiary Gardens downtown. These look like Chia pets. In addition the use of paint detracts from the whole topiary idea. But the elephants are cool. Inside the Ikenobo Society of Ohio had a show. The flowers were unique and beautiful. Simple yet elegant in their presentation. We had popped into the Conservatory for a brief visit, but with the new gardens, the topiary, the butterflies and the Ikenobo we ended up having a full morning of fantastic sights and smells. Regular followers of this blog will know we often visit parks and gardens for the interesting landscaping that many contain. A small park in downtown Columbus is no different. As you approach you are welcomed by a flower bed surrounded by some shrubs. But this is no ordinary park – it is the Topiary Garden, sculptures in nature. 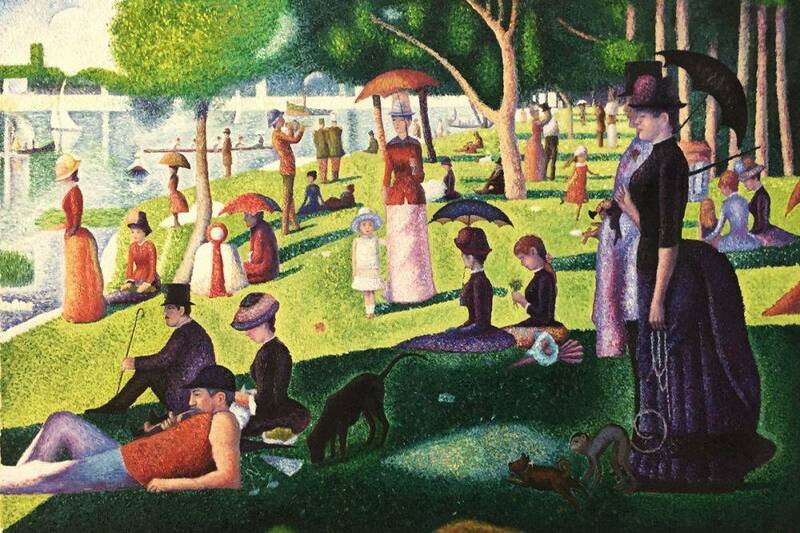 This park’s subject is the George Seurat painting A Sunday Afternoon on the Isle of La Grande Jatte. The shrubberies were groomed to make the painting. The couple with the umbrella are the center of the design. Soldiers with helmets stand guard. Some of the figures are easy to make out. They use framing the force the shrubs into the correct shapes. Interestingly we did indeed spend some of a Sunday afternoon in the park. An overview including the rowing crew. The garden is composed of 54 human figures, eight boats, three dogs and monkey and a cat. It was first planted in 1988, and has continued to be enhanced through the years. Next door is the former Ohio School for the Deaf. This school was built in 1868, and features a number of gargoyles shaped as faces above the doorways. Rather than the normal grotesque gargoyles, these are friendly faces. To me they are the children of the school welcoming others. The keep a watchful eye on all who arrive. Situated on the east side of the building, they face the Topiary Gardens. Not quite sure many of them are sticking their tongues out, but they add some humor to the impressive building. A visit to the Gardens and the school are a must. For this warm and windy Saturday we headed to Mansfield to see the Kingwood Center Gardens. These gardens, and the mansion, were built by Charles King, who made his money leading a company that made electrical fittings for the trolleys and railroads of the early 1900s. The house and grounds were built in 1926, and feature 47 acres of formal gardens, as well as greenhouses. When Mr King died in the 1950s the estate was turned over to a private foundation that to this day own and operate the beautiful grounds. My first photo of the day was taken with the ‘wrong’ settings. A couple of nights earlier there was a vivid full moon and I had changed the white balance and numerous other settings, forgetting to reset them. When I took the photo of the fountain it did not represent it’s actual look, but rather this ‘full moon’ look. Returning my camera to more proper settings for garden photography we set off. We were immediately impressed with the landscaping. As we made our way through the gardens we passed numerous planters with interesting mixes within each one. The stone paths and perfectly trimmed hedges framed the flora. The newest lens was perfect for some close ups. With the full frame capabilities, getting clear shots of the flowers is much easier. So much easier I came home with numerous photos of insects on plants and flowers. Additional planters on stone walls. As with most gardens, weddings are a big business. Unfortunately for the bride this day some heavy rains came later, after we finished our tour. The house opened at 11, and a local peacock was there waiting for entry. While not extensive, there was some statuary well placed throughout the gardens. The carriage house had 5 bays for automobiles. What could be better, a 5 car garage and great landscaping. One of the greenhouses featured cacti. More insect closeups, this time in the greenhouse. Fortunately for this one he stayed away from the nearby Venus fly trap. We were pleasantly surprised by the Kingwood Center Gardens. While not Longwood (who is), this is one of the best, if not the best, gardens we have seen in Ohio. Our destination this day was Elkhart, Indiana – home of a collection of ‘Quilt Gardens’ and ‘Quilt Murals’. But first a quick stop at the Indiana Welcome Center in Hammond. Hammond is in Lake County, which is a mix of industrial, suburban and farming set along the south shore of Lake Michigan. Their welcome center is built to represent the waves, silos and steel mills of the county. The movie A Christmas Story was set in Hammond (although filmed in Cleveland and Toronto). One of the famous scenes is where a little kid is talked into sticking his tongue on a freezing cold flag pole, thus getting stuck. It is recreated here in a statue. Once we arrived in Elkhart we saw our first mural. The entire county did have a collection of decorated elk though. We spent an hour at the Wellfield Arboretum, which has a nice collection of sculptures, plants and flowers. There were also some water features along with a number of painted ‘sticks’. The arboretum was well kept. In nearby Middlebury is the ‘World’s Fair Gardens’. These gardens were first presented in the Chicago Century of Progress fair in the 1930s. They were later moved to Middlebury where they have existed ever since. The Middlebury site had a quilt gardens that was easier to see as it was on a small hill. Like many cities in America Columbus had significant growth in the early 1900s. One of the main drivers of this growth was the development of streetcars, which allowed people to live further than walking distance from their place of work. One of those neighborhoods in Columbus is the Old Oaks neighborhood just southeast of downtown. When the streetcar line was electrified in 1891 the neighborhood followed shortly after. On this sunny warm June day they had their annual Home and Garden Tour. But before we could tour the homes we made a stop at Holy Rosary St John Church to purchase our tickets. The church has impressive stained glass throughout. As with many inner city neighborhoods there had been a long period of lack of investment leading to deterioration. Many neighborhoods, including Old Oaks, has had an infusion of gentrification over the last 20-30 years. While many Columbus neighborhoods have had a near complete gentrification, Old Oaks still has a mix of the original residents and those who have come in and rehabbed a home. The neighborhood is nearly all stately brick homes. There is an interesting mix of those that are in dire need of repair, those that have been fully restored, and then those like this one that are in between. It is understandable with the amount of work and money it takes. Amongst the large brick homes is this beautiful Craftsman style home – note the house on the left is boarded up – waiting for the right person to come in and bring her back. Not all of the homes shown here were on the official tour, but grace the streets of the neighborhood. With the flags it is clear you are in Ohio – USA. At the edge of the neighborhood, along Livingston Avenue is Greek Revival style home that was built much earlier than the rest of the neighborhood – dating from 1852. Known as the Caroline Brown home, it was a stop on the Underground Railroad to freedom for slaves prior to, and during the Civil War of the 1860s. A few of the interiors of the homes were open for inspection. They were all beautifully restored and decorated. A great use of an old pull down school map – a window shade! Some had stained glass windows (you can also see the use of stained glass from the street as well). Fireplaces were present in many of the bedrooms. All of the homes have excellent wood work throughout. Another example of a bedroom with a fireplace. An older look was present in one of the homes. The highlights though were the garden tours – this one featured a massive pergola leading to the original (apparently un-restored) garage. An arch frames the garden of another home. If nature wipes out your tree, make it art. Another had a number of artistic touches include beer bottles made into candles. The garages are in the rear, as originally they were carriage houses, to house horses. Alleys line all the houses in the back. Technically not a garden, but the front porches were great – giving the neighborhood a sense of community. Old Oaks is a community in transition but as is remains a vibrant part of the city. Thanks to all who shared their homes and gardens! As our tour ended back on Livingston Avenue, we visited the boyhood home of Eddie Rickenbacker, truly one of America’s great men. Raised in this humble house in the early 1900s, Eddie went on to become a record land speed racer, a World War I fighter pilot, a pioneer in the development of Aviation, and many other things. Somebody should make a movie (although they did back in the 1940s it could be done so much better now – and Eddie has the stories that would be worth telling).